Local lawyer Joyce Swedburg has convinced “the mister” to hold a charity event in the lower level (basement) of Marshfield Manor. Her ex-husband, Dr. Leland Keay is also lending a hand in the planning. Grace is happy to help any way she can but acting as a referee between the exes is not what she had in mind. This time Grace takes us to a lower level of the manor and the basement of her beautiful historic home and they both reveal surprises. These surprises kept the pages flying. Julie Hyzy writes in such a way that the reader feels like part of the story. We are members of the crowd in both places just taking in the action. I was shocked to see how well Grace worked with Hillary on the details of the renovation of her home. Hillary was like a totally different person now that she is doing something she loves to do. Grace’s assistant Frances never fails to crack me up. They make a great team, even with the occasional barbs Frances throw out there. Detective Flynn just knows Grace is going to be butting in on his case and with his partner is out of commission he almost welcomes her help. I said almost because he really would like all the accolades to himself when the case is solved. But when she uncovers a very important clue he sees the writing on the wall. And Private Eye Tooney again finds himself in the right place at the right time. Hyzy just keeps getting better and better. With each story Grace continues to evolve and we learn more about Marshfield Manor too. I really enjoyed that the story also took us to Grace’s “Painted Lady” home. The outside renovations sound gorgeous. I hope to hear all about the inside too. 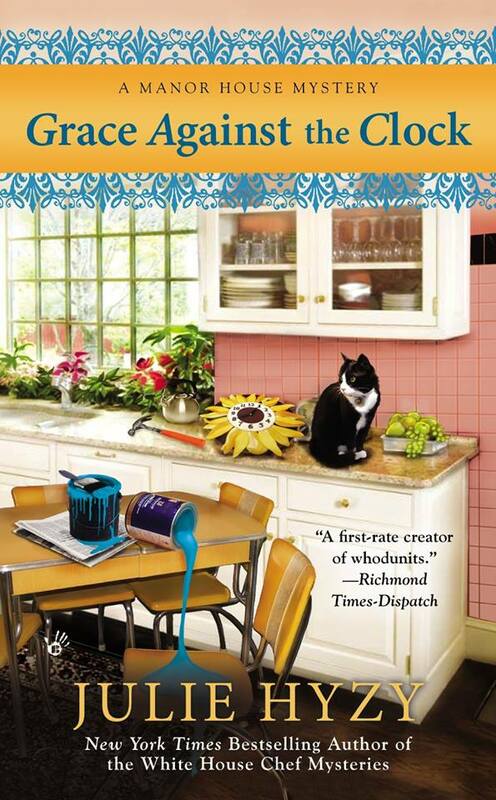 You really can’t go wrong with a cozy mystery by Julie Hyzy. I have been delighted with each Manor House Mystery and the White House Mysteries too. They are all perfect to escape into on the beach or in a comfy chair in front of the fire. To find out more about Julie and her books visit her webpage here. I really have to play catch-up with this series. I’ve not read this series yet. Gonna have to check it out. I love the cover of this one. Looks just like my cat sitting up on the counter.